Santa Rita Soapstone is a very hard soap stone used in counters tops and a really cool fireplace called a masonry heater that works by heating up a large mass of soapstone to give off heat long after the fire has died. Did I mention this stuff is hard? Yeah… it will toast a carbide bit in about 30 seconds without coolant. It has a super low talc content, making this Santa Rita soap stone incredibly durable. Unfortunately that means that unlike the other soapstones we use, this stuff can not be worked using regular wood working tools. Much like the marble d6’s we made a while back, Santa Rita soapstone has to be cut using a wet saw and milled using stone milling techniques. Santa Rita Soapstone is quarried in Brazil and is unique in its deep forest green coloration. This is a seriously dark green. Nearly black with a shimmering crystalline spiderweb. The engraving gives a frosted effect making the numbers highly visible. And like the rest of our stone dice, all Santa Rita Soapstone dice come in a laser cut compartmentalized walnut dice box. They look great. Maybe you could do a repeat in 2015 which is when my budget should have a surplus again (assuming no new disasters). How are the numbers applied? I intend to use them if I purchase them pretty regularly and I am curious how likely the numbers are to fade. The numbers are laser engraved. It is very unlikely that you could remove enough of the face of the dice to ever make them unreadable. Plus they have a lifetime warranty. the numbers won’t fade. as john said, they are laser engraved. so short of rolling them on 60 grit sand paper, you’ll never remove enough material to make them illegible. Do you think you will ever offer the 10 d10 in Santa Rita Soapstone? probably not. there it just not enough demand for d10 sets. 1 out every 200 sets we make are d10’s. Is it possible to just get the 2d10 for percentage rolls of this? I have ordered this on 2014-07-22 23:19:00 and never received it. Please someone contact me about this I have yet to receive a response. 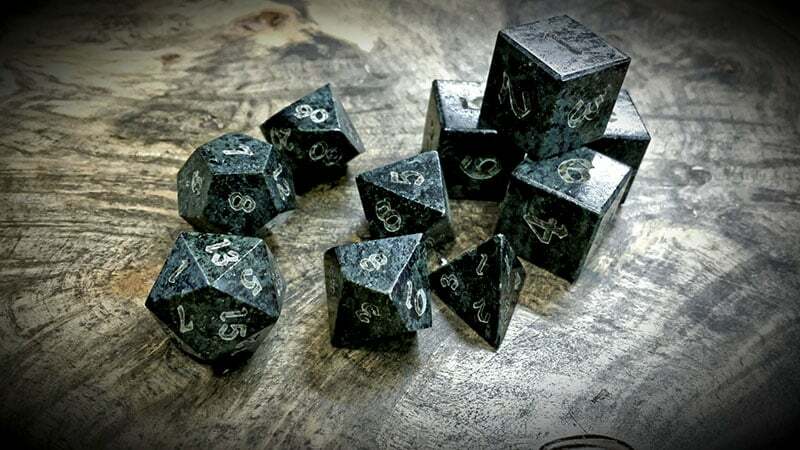 Hi, Im interested in purchasing 4x6D in the Soapstone – is it possible to get different colours in opposing pairs? if not when will your Marble be available as well? I love your site and dice! Quick question – it says above this soap stone is very hard… does that mean it will hold up well? Or if I’m rolling several dice at once will they chip? These dice look amazing, though I would only need 1D20, 1D12, 2D10, 1D8, 1D6, and 1D4. Can a set be purchased like this? When will you have these for sale again? Nice looking dice, certainly on my shopping list when a set comes back on sale. apparently a machine of their’s is not working, so they can’t make them. I ordered a set a couple of months ago and I’m still waiting on them, they replied with a response along those lines. hopefully they can finish them soon. When would these become available for purchase again? I currently don’t have any income, but they might be somehthing I definitely look into. When are these going to be available for purchase? I got a full set, and they’re beautiful! I rubbed a little white chalk into the numbers to really make them stand out. it will still be some time yet before we make any more of these dice. they cause our machines to rust something terrible so we’ll need to build a dedicated machine for working them before we make any more. Here’s hoping its worth it to get that dedicated stone machine running! 6d6 order ready right here if it does! Beautiful work even just in pictures. I’m playing a campaign with a warlock who’s patron is Yog Sothoth and these would be perfect! Any chance they will again be available? these won’t be making a comeback anything soon. sorry. you might want to check out our other elemental sets.